Pharmacological products of new generation replacing the old proven drugs for cough. Many familiar from childhood with the drug «Pertussin», which combines high effectiveness and affordable price range. The drug has no analogues due to its unique combination of active components. In order to achieve positive dynamics in pulmonary diseases, you should know what cough take «Pertussin». In order to understand «Pertussin» from dry or wet cough, you should consider the composition of the drug. Combination medication composed of ingredients of plant and synthetic origin. Vegetable based liquid extract of thyme, which helps to stimulate the secretory activity of the bronchial glands, thinning of pathological phlegm and increase its excretion. Synthetic component acts as potassium bromide, which has a sedative effect and can cut the symptoms as a dry cough reflex by acting at Central and peripheral level, while not inhibiting respiratory function. Therefore, we can conclude that the therapeutic effect of the drug effect on both dry and productive cough. Dry cough «Pertussin» contributes to the rapid transformation of dry cough syndrome in the wet. When wet encourages the acceleration of the transport function of the respiratory system. Among the auxiliary substances – ethyl alcohol and sucrose solutions, so proceed with caution you should use the patients with the deficiency/lack of insulin in the body and mental addiction to alcohol. Pediatricians prefer the «Pertussin» dry cough child with paroxysmal character, provoking the gag reflex, as the drug inhibits the activity of the forced exhalations. Important! «Pertussin» does not affect the inflammatory lesion, and acts as palliative care. To achieve positive dynamics of the disease requires complex treatment. 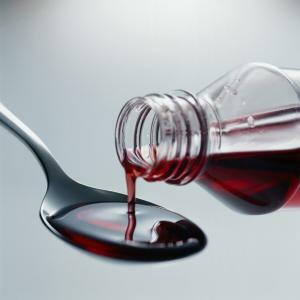 «Pertussin» is a product of domestic production sold in the form of syrup in containers of 50, 100, and 120 ml Medicine «Pertussin» cough has a brown tint with a specific herbal smell, thick consistency with a sweet taste. In the market you can find a solution for intake «Pertussin – CH» manufactured by Yaroslavl and Moscow FRAM factories with almost identical therapeutic effect as the same name of the drug, with only minor difference in composition. To treat children up to 12 years preferable to choose the solution, on achieving the age of twelve and for the treatment of the adult population – in the form of syrup. Pills «Pertussin» cough manufacturer of pharmaceutical products are not released. Tablet form with the same name «Pertussin», represented by the German pharmaceutical company Medphano Arzneimittel GmbH, but part of the drug eliminates the presence of bromide of potassium. The medication consists solely of plant components (dry extract of thyme). For reference! The average cost of a domestic «Pertussin» in the range of 150 rubles, while the price of German drug equal to € 30. The required dosage is determined by a treating specialist after the differentiation of the species of cough syndrome, medical history of the patient. 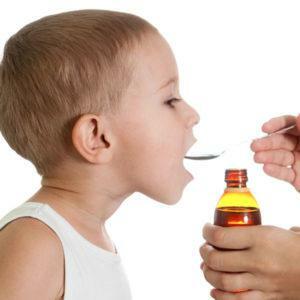 children from 12 years and adults – three meals a day intake of 10-15 ml. To prevent irritation of the gastrointestinal tract, the drug must be taken after a meal. The course of treatment from 7 to 14 days. In the presence of strict indications, the doctor may prescribe a combination of «Pertussin» with «Mukaltin», denoting the proportions in each individual case. Self-mixing these drugs is not recommended, especially children under five years of age. In most cases, mucolytics can cause increased cough reflex. Important! Prohibited concomitant treatment «Pertussin» cough medicines («Pour», «Codelac», etc.) that may lead to pathological stagnation of phlegm and reproduction of pathogenic microorganisms. To eliminate paroxysmal cough and a good rest at night, doctors make use of the antitussive funds and «Pertussin» according to the following scheme: during the day, use an expectorant, the last reception of the drug at bedtime to replace a drug that suppresses the cough reflex. Among the contraindications to using the medicine pregnancy and period of lactation because the active substances could have a negative impact on the formation of the fetus, provoke a gag reflex hypertonicity of the uterus, to raise HELL. Not administered to children under the age of three. malabsorption of glucose/galactose, and fructose. During therapy, the drug does not exclude the manifestation of side effects such as heartburn, of the vomiting reflex, itching/rashes of the skin, copious watery eyes, irritability, ataxia, pain in the digestive tract, tachycardia/arrhythmia. Non-prescription status of a medicine is not evidence for self-appointment «Pertussin», before treatment, mandatory doctor consultation. The demand for the drug due to its effectiveness and affordable cost. Thanks to the combination of active substances, «Pertussin» is a unique drug with a wide therapeutic effect.